The map below shows the boundary of the Solway, Border and Eden LAG. 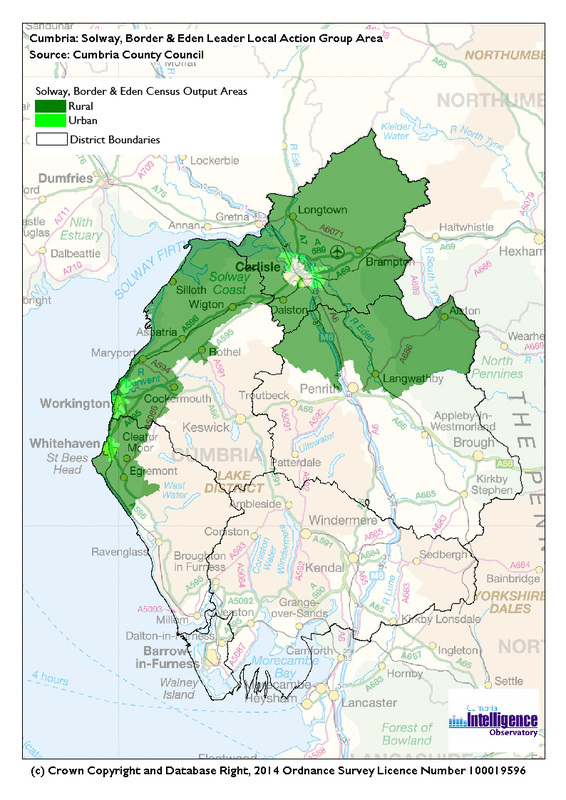 The LAG area does include the rural hub towns of Workington & Whitehaven. In order for an applicant located in a hub town to be eligible for LEADER funding, the project activity proposed will need to take place in and benefit the population of the surrounding rural areas rather than the population of the hub town itself. Wards within Hub Towns are eligible but there must be a benefit within the rural areas of Solway, Border and Eden. To find out if you live in an eligible LAG area please download the postcode checker below. Please be aware that this is a large document and may take a few minutes to download. Enter your full postcode, scroll to the bottom of the page and your postcode should be within the area of a Local Action Group. Your LEADER Local Action Group should be Solway, Border and Eden. Those in the Lake District National Park and south of Cumbria might be eligible for RDPE support from Cumbria Fells & Dales LAG. To view a map of the Solway Border & Eden area please see below.